In 1980-81, Mike Bossy scored 50 goals in 50 games, becoming the second player to accomplish the feat. The first? 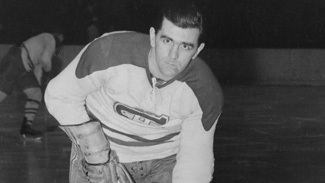 Maurice "Rocket" Richard. "Anytime you're having success, you see that certain things are achievable. Probably even more so because [Maurice] was from my hometown and he had the aura that he had around him," Bossy said, referring to the Montreal roots he shares with Richard, who scored his last goal when Bossy was 3 years old. "It made the attempt to do it very satisfying, and when I achieved it, when you're, at the time, the only other person to do something that a legend of the sport did, it's very satisfying." While scoring 50 goals in 50 games gave Bossy a chance to match one of the League's all-time best, he spent the rest of his career making his own mark. Bossy began his assault on the record book as soon as he entered the League with the New York Islanders in 1977. Famously self-assured, Bossy predicted he would score 50 goals in his rookie season. He scored 53, then a record, and won the Calder Trophy. "I was fortunate to have the opportunity to play with great players, a great centerman in Bryan Trottier, and things just started off real well right from the get go," Bossy told NHL.com. "I guess, in a sense, I am extremely confident in my abilities, but I was still somewhat surprised that I was able to get 53." Judging from the rest of his career, he shouldn't have been. Starting with his rookie year, Bossy scored at least 50 goals for nine straight seasons from 1977-86, a record unlikely to be matched anytime soon. He also owns the highest goals-per-game average in NHL history (.762) and once scored three hat tricks in a row. It stands to reason that for many of the 500-goal club's 42 members, earning entry to the select group is equivalent to running a marathon. For Bossy, it was more of a sprint. He scored his first 100 goals in 129 games -- faster than anyone in modern NHL history -- and required 647 games to score 500. At the time, he was the fastest player in NHL history to 500 goals, and he's still third behind Wayne Gretzky and Mario Lemieux. "I don't want to sound brash, but I knew I was going to get there," Bossy said. "You know when you're averaging 50 goals a year, the only thing that could've stopped me at the time, I believed, was injuries. I was quite lucky not to have any serious injuries leading up to the 500th." That luck didn't last much longer after the milestone goal -- a back injury ended Bossy's career in 1987 at age 30 after 10 seasons and 573 goals. However, he was able to accomplish more in a decade, both individually and with the Islanders, than most players could hope to in two or three. In addition to his 573 regular-season goals, Bossy fired home 85 playoff goals, helping lead the Islanders to four straight Stanley Cups. Two of those playoff goals were back-to-back Stanley Cup-winners in 1982 and 1983; the 1982 goal against the Vancouver Canucks in Game 4 of the Final, in which he scored while flying through the air after being checked, is one of the great goals of all-time. Though Bossy was among hockey's all-time sharpshooters -- his 21.2 career shooting percentage is among the best in NHL history -- it's ironic that goal No. 500 came into an empty net. He scored No. 499 against Boston's Doug Keans on Jan. 2, 1986, to break a 5-5 tie late in the third period, then scored into an empty net with 17 seconds remaining. The absence of a goaltender didn't diminish the celebration for Bossy. "I don't think the one before my 500th or the one after my 500th was into an open net, so it just so happens that that goal fell into that category," he said. "I mean, I was just as excited for it as if it would've been one of those game-winners or a top shelf. It was a milestone that I was aiming for and I was extremely happy to achieve it." Reaching 500 goals puts Bossy in an esteemed group of scorers, among them fellow Montreal legends Guy Lafleur, Jean Beliveau and, of course, Richard. "Maurice was before my time, but there's no doubt I grew up with the Maurice Richard legend," Bossy said. "What kind of player he was, the passion he had for the game, his knack for scoring and determination for scoring."